DC vibrating bells produce a long continuous ringing sound. The striker continues to strike the gong in rapid-fire action as long as current is applied. Universal Adaptaplate mounts directly on surface or fits any single gang box, 3 1/4" (83mm), 3 1/2" (89mm), or 4" (102mm) octagon box, or any plaster cover with mounting holes on 2 3/4" (70mm) centers. 6" and 10" bells also mount on 4" (102mm) square boxes. 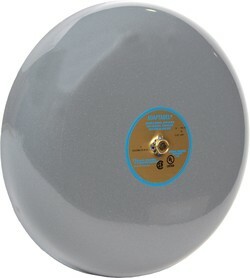 The DC vibrating bell can be used in outdoor applications when mounted on Cat. No. 449 weatherproof back box. See Accessories. Specified for timing, scheduling, and general alarm applications.